Karachi: A report submitted in anti-terrorism court (ATC) hearing Naqeebullah Mehsud murder case declared the killing of four people in Karachi last year an incident of extra-judicial killing. The court approved recommendation in the report to quash five cases against Naqeebullah and three others. Naqeebullah Mehsud, Sabir, Nazar Jan and Ishaq were declared terrorists and killed in a staged encounter. According to the report, the inquiry committee and the investigation officer inspected the crime scene. No marks of fired bullets and hand grenades were found at the poultry farm, which was pointed out as the scene of the encounter, the report said. The circumstantial evidences indicate that it was a baseless and staged encounter, the report further said. According to the report, all four people including Naqeebullah were killed in a room and the weapons were kept at the scene afterwards. The report also said that former Senior Superintendent Police (SSP) Malir Rao Anwar and his other accomplices were present at the time of the incident. 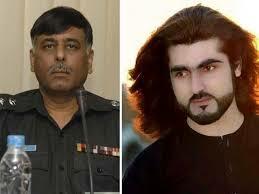 Last year, former SSP Malir Rao Anwar along with other police officials had been booked for allegedly killing four men, including South Waziristan youth Naqeebullah Mehsud in a fake police encounter in Shah Latif Town on Jan 13. The murder triggered widespread outrage on social media when the family of aspiring fashion model rejected claims that Mehsud was a member of a terrorist outfit and had any criminal record. On July 11, 2018, the ATC granted bail to Anwar against a surety of Rs 1 million. Earlier this month, the Supreme Court turned down a petition by Anwar, seeking removal of his name from the Exit Control List (ECL). A bench of the apex court headed by Chief Justice of Pakistan Mian Saqib Nisar rejected the former cop’s plea. It is pertinent to mention here that Rao Anwar retired from police service on Jan 1 this year.